“To provide quality products and exceptional service at affordable prices” So what is their prized achievement you may ask? Forcing suppliers to rethink their strategies, pricing and levels of service – basically reinventing the market space!! Hurricane Equipment imports equipment from America, Canada, China, Germany, Taiwan, Finland and France. The business owners are sure to visit all the factories for strict quality control prior to any purchase. Their first Spraybooth was sold in March 2006 – and have since upgraded the spraybooths more than fourteen times. Short after in January 2007, the first Chassis Bench was sold, and there are well over 200 in the market – and we already have more than 210 chassis benches in the market. 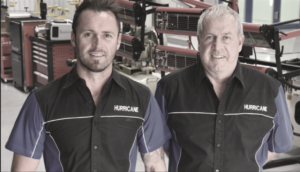 Through hard work and constant attention to detail, Hurricane Equipment have achieved Toyota approval on our chassis benches, which also meet all manufacturer requirements except for BMW and Mercedes Benz. 50 Autorobot Electronic Measuring Systems, which pass Volkswagen and Audi approval requirements. An extensive product range also sets them apart – over 120 products relating to panel beating industry in the market. Our forte is the result of the owners and directors Andrew and Duncan Mackie having twenty five years of experience in the panel beating industry. They empathize with their customers today, as they also went through receiving poor service and exorbitant prices charged by suppliers in the panel beating industry. For references on any of our products please feel free to contact us, we would also be happy to provide you with a list of clients who use Hurricane products.